The Allenton School office is open from 8.30am until 3.30pm each school day. Annmarie McCloy and Jo Snowball are there to help you with enrolling your child and purchasing uniform items along with other general administration regarding your child. If your child is sick please make contact with the office so they can record their absence or help with the administering of medications when they return to school. Hair accessories can only be black, brown, maroon or yellow. Students are able to purchase lunch through the school office from local businesses. Please make sure your child's name and room number are clearly on the envelope before putting them in the box in the office. Click on the file below to see the options available. We are fortunate at Allenton School to have a school road patrol crossing programme operating. At the end of their Year 5 year, students volunteer to be trained in how to do road patrol and a placed a roster the following year to do road patrol in the mornings and afternoons. It is great to know that students are working to help ensure other students get to school safely. Please remember to follow the instructions of the students on road patrol and wait for them to tell you went it is safe to cross. If you would like to help with adult supervision during road patrol, please contact the school office. 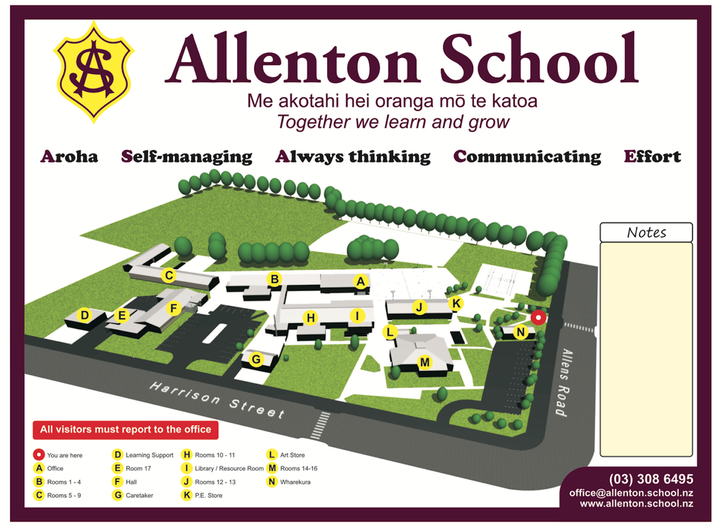 For more information about Allenton School please download the document below.